The results of the lease sale held last December by the US Bureau of Ocean Energy Management (BOEM) demonstrate the rising level of interest in offshore wind in the US. The lease sale for sites off the coast of Massachusetts drew winning bids of US$405M – almost 10 times the total winning bids generated by the previous lease sale two years earlier. Heavyweights in the European offshore wind sector dominated the bidding. Topping the list were Equinor Wind US, LLC, an affiliate of Norway state-owned Equinor, Mayflower Wind Energy, LLC, a 50-50 joint venture between Shell New Energies US and EDPR Offshore North America, LLC, majority owned by Energias de Portugal, SA, and Vineyard Wind, LLC, a 50-50 joint venture between Denmark’s Copenhagen Infrastructure Partners and Avangrid Renewables, part of Spain’s Iberdola Group. BOEM has now issued 12 active commercial wind energy leases. While the activity is concentrated off the US Atlantic coast, projects have also been proposed off California and Hawaii, and the US Great Lakes. A white paper published under the Special Initiative for Offshore Wind (SOIW) of the University of Delaware College of Earth, Ocean & Environment estimates that 18.6 GW of offshore wind power will be generated by seven offshore windfarms in operation in the US Northeast by 2030. 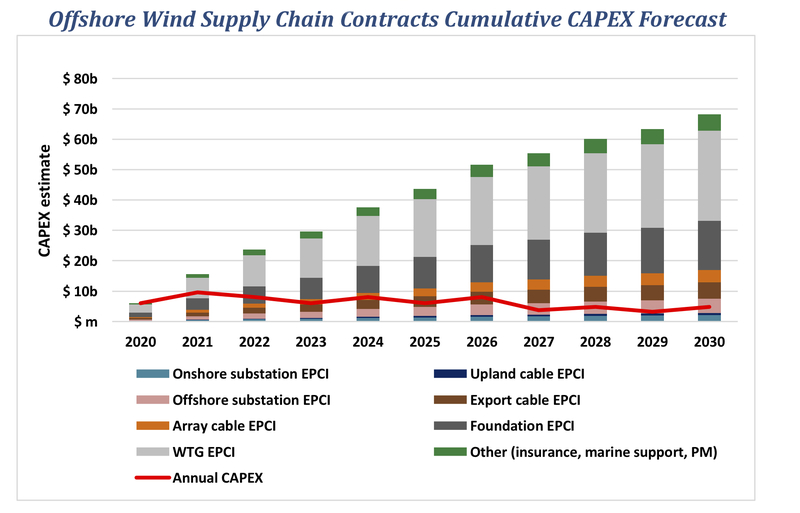 Titled Supply Chain Contracting Forecast for US Offshore Wind Power, the report by Dr Stephanie A McClellan provides a granular breakdown of the components of each of these seven projects, estimating total capital expenditures of US$70Bn. Major opportunities will be created for port staging, survey and geophysical service companies, crew transfer vessel, service offshore vessel, subsea and cable-laying vessel owners, wind turbine manufacturers, foundation installation and other suppliers. While the Trump administration has been supportive of offshore wind development as part of its “all of the above” energy policy, some states have also touted renewable energy in an effort to cut greenhouse gas emissions and the potential for job creation, in some cases requiring locally-provided content and services. Another topic that often rears its head in the US offshore energy market involves the US cabotage laws, known collectively as the Jones Act. The Jones Act requires any vessel transporting cargo between US ports to be built in the US, owned by a US citizen, to operate under the US flag and be crewed by Americans. For the purposes of the Jones Act, a wind turbine foundation on the seabed is considered a US port. This means that a non-Jones Act wind turbine installation vessel (WTIV) cannot transport components from an on-shore port to a turbine foundation. To use a non-US-flag vessel, components from a US port must be loaded onto a US-flag feeder vessel. Once the components are shipped to the project site, they can be lifted off by a non-US-flag WTIV onto the foundation without moving. In 2016, Brave Tern, owned by Fred Olsen Windcarrier, supported the installation of the wind turbines at the first US commercial offshore windfarm, Block Island Wind Farm, off Rhode Island. 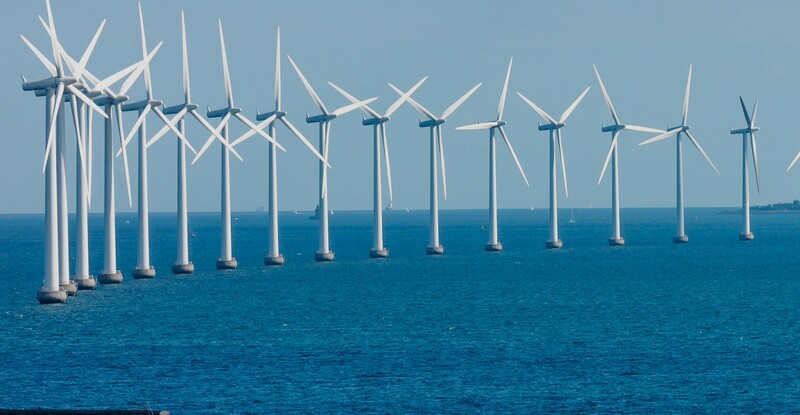 Last year, Block Island Wind Farm came under the control of one of the largest operators of offshore wind turbines in the world, Denmark’s Ørsted, following its acquisition of Deepwater Wind in October of last year. The New England states Massachusetts and Rhode Island have been at the forefront of developing offshore wind in the US. In 2016, Massachusetts passed a law requiring its utilities to procure 1.6 GW of offshore wind power by 2027. New legislation passed by Massachusetts lawmakers in August 2018 doubled the offshore wind target to 3.2 GW by 2035.